A subtle frame with attractive, curved armrests contrasts beautifully with the volume of the outdoor cushions which are supported by a weave in broad textilene straps. 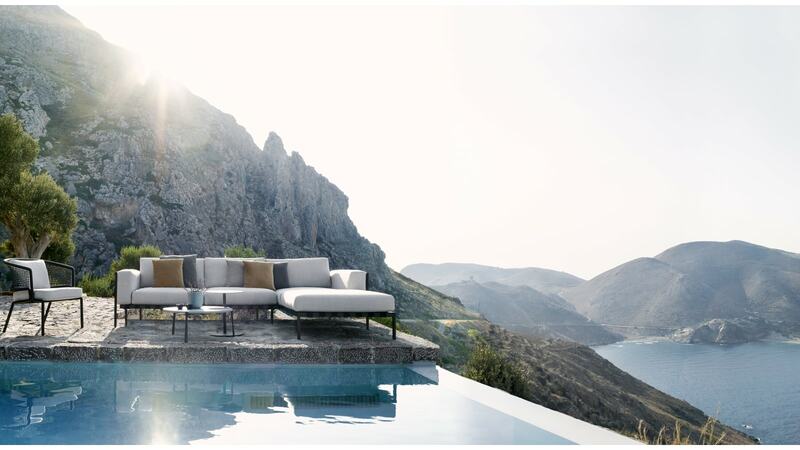 Timeless and elegant, the Natal Alu Sofa is an outdoor sofa that will fit many terraces. Thirteen different modules compose the outdoor sofa of your liking. Add the two different frame colours (white and wénge) and more than 70 available outdoor fabrics for the cushions, and the possibilities are endless. Special attention is paid to the outdoor cushions which can be left outside during the whole outdoor season. The ventilating filling is covered in a waterproof laminated polypropylene cover which is water resistant. All stitches have an extra inside cover to prevent water from penetrating. The aluminium frame of the sofa is powdercoated with ultra durable lacquer for extra scratch resistance.